I am a Shannon 38' ketch, Hull #1, the first boat built by this prestigious New England boat builder, and the 'plug' for their production line. I am pretty traditional with an aft cockpit, forward-facing navigation area at base of companionway, 2 settees and captain's table amidships, single head and a queen-sized 'V' berth forward. Storm Trysail on its own track. Genoa/yankee on NC-42 ProFurl reefing system. Staysail on Mariner furler (hank-on sail, no reefing). 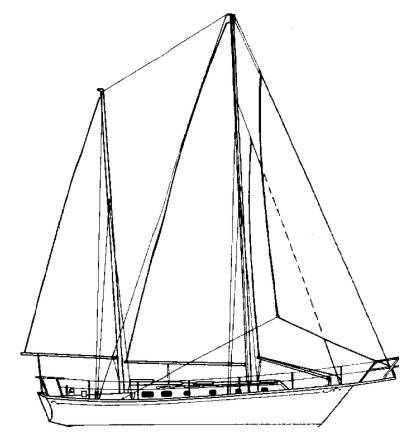 Slab reefing on main with single-line/reef point leading to cockpit. 23' telescoping reaching pole w/3 guys for control. Or if you would like more information on my sister-ships, visit Shannon Yachts site.